Vue panoramique! Cette superficie offre une intimité et une sérénité incomparables! Lieu idéal pour les réunions de famille, les retraites de restauration, les ateliers d'entreprise, les petits mariages et les conférences. The cabin was absolutely beautiful! Directions to find it were very easy to follow. Inside the cabin was very clean and welcoming. There were fresh flowers on the tables and chopped wood at the door ready for us to use. The property was very peaceful and we made great use of the hot tub! Owners were quick to respond to questions and very accommodating with our group. Overall it was a great weekend! Our group was so impressed by the beauty, cleanliness and ease to rent this Lakefront Rustic Log Cabin. The spacious room was perfect for the group of 8. Fun was had, memories were made and hope to make a stay here again! This cottage was the perfect winter getaway for our family! Wood fireplace,hot tub were awesome ! Our family loved the experience! We just finished our weeklong stay here and the cottage was exactly as advertised. The cottage is large and roomy with all necessary modern conveniences to make anyone's stay comfortable. The outside temperatures were extremely hot for much of our stay, but the window air conditioners in the bedrooms upstairs along with some fans made the entire cottage cool and comfortable. I understand that they are aiming to put central air in for the Spring of 2019, which will be another excellent feature. Having a covered veranda area and two decks (one off the upstairs bedroom and one off the main floor) gave us great options to relax no matter what time of day. The property itself is quiet and peaceful and there is plenty of space for kids and dogs to run around. The hot tub is a nice touch as well. I am into offroading/ATVing and the access to hundreds of kilometers of trails right from the property was extremely easy. If you are into offroading or snowmobiling this is definitely a place to consider staying. There are a number of places nearby to get food if you would rather grab a bite out. The pizza at the Hillside Eatery was one of the best we have ever had and the ice cream at the Le Gouter in Alberta Beach was great. As advertised by the owner, the beach access is a bit difficult due to the impact of storms and erosion, but we were always careful when going down that path and our 6 and 8 year old children managed to navigate the path to the water without help. If you're considering this area to stay this property should definitely be given strong consideration. Great spacious cabin with wonderful amenities and views. Winter weather kept us indoors, but there was plenty of space for all 10 of us. I went to your log cabin for a weekend together with some old friends, so impressed with your log home, you had everything in your cabin that we needed to have a great weekend, loved the fire place the spacious rooms , sitting in the hotub on the deck and looking out at the lake was so relaxing, It really was the perfect weekend! We definitely will be back! Offrant une belle 2100 sq. 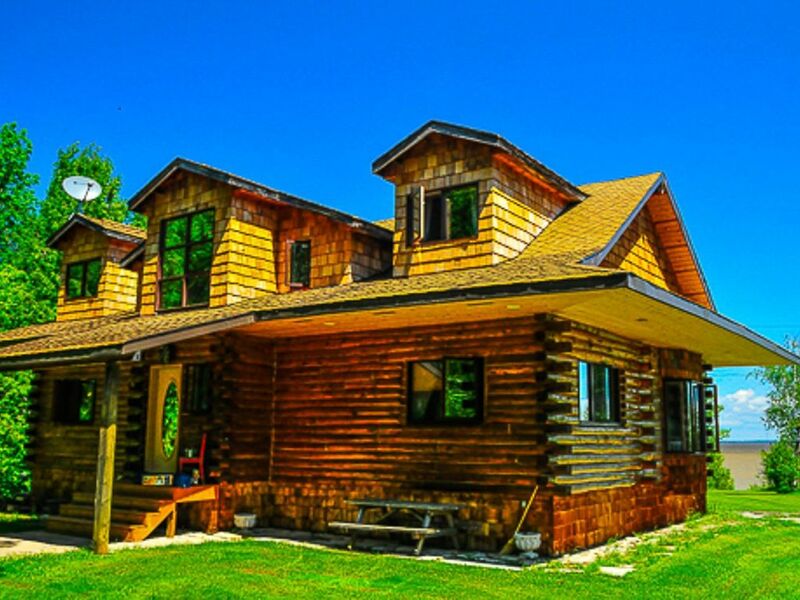 Ft. Rustique Loghouse (quatre saisons) Lakefront sur 5 acres avec chemin privé pour la location de l'année. La région offre de ski de fond, la motoneige et la pêche sur glace dont le doré et le brochet. parc provincial de la plage Victoria et le parc provincial Elk Island à seulement 10 minutes en voiture et Grand Beach se trouve à 15 minutes en voiture. Grand Beach et les plages de l'Est du Manitoba ont été une destination populaire de vacances depuis 1916. Grand Beach est une heure de route au nord de Winnipeg sur l'autoroute 59. La région offre de randonnée le long du sentier Wild Wings de Grand Beach Marsh du parc provincial ainsi que la promenade avec du sable de silice blanche, et un 8 mètres de haut dune spectaculaire. Traverse Bay Aurora (Northern Lights) est un borealis très lumineux qui orne le ciel sur les eaux de Traverse Bay sur le lac Winnipeg. *$500 deposit required to hold reservation with a non-refundable deposit of $200; the final payment is due 90 days prior to arrival date. To clarify, in the event of a cancellation $200.00 is non-refundable from the $500.00 deposit *$500 deposit is fully refundable day of departure * Payments accepted: e Transfer, cheque, PayPal (2.9% additional fees apply) * 2 night minimum stay * July and August weekly rentals only considered during the high season months * Additional charges apply for more than 6 adults * Discounts applicable for returning guests * All rates listed in CAD $ *Cancellation Policy - 90 days prior to reservations Cancellation Policy: Cancellations past the 90 days policy - no refund shall be returned *Pets are considered and require pre-approval; additional charges apply for pets Please note: The house has a NO SMOKING policy.